Retired kindergarten teacher Sharon Feldt moved to Hopkins County, Texas about five years ago. Her interest in writing fiction found a catalyst and a home when she joined the Silver Leos Writers Guild through Texas A and M University in Commerce, Texas. There, she met a friendly and nurturing community of writers who gladly share their experience and expertise with those new to the craft. Within that five years, Sharon has authored three books and has three more manuscripts waiting in the wings. Her first, ‘The Stable”, is an illustrated children’s Christmas story narrated by the animals in the manger during the night of Jesus’ birth. Her next book was about a precocious little red-haired girl, Sarah O’Shea and her dog, Claude. Published in 2016, “The Scary Hair of Sarah O’Shea” drew the attention of a national book review contest based in Seattle, Washington. 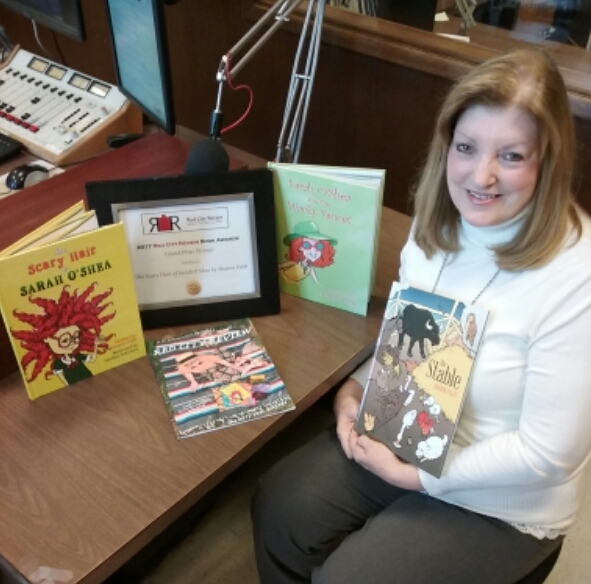 Earlier this year, Sharon was invited to enter her book for review, and after a few weeks was contacted that she was not only the first-place winner in the Children’s Fiction category but that her book was the Grand Prize Winner in all genres. “The Scary Hair of Sarah O’Shea” was featured on the cover of the 2017 Red City Review. Sharon has traveled to a number of large Texas cities, attending book signings and speaking at book club events. In the meantime, she produced her second book in the series, “Sarah O’Shea and the Wacky Faucet”. Sharon is married to attorney John Feldt and they live in Sulphur Springs. In addition to being 2017 President of Silver Leos Writers Guild Sharon is also President of her book club, the Bright Star Literary Society. She is also a member of the Northeast Texas Choral Society and the Bright Star Quilt Guild.